I got a food bowl for their food, and a water bowl, And then I was all set up and just waiting for my bearded dragons! What's the best Vivarium Background for a Bearded Dragon? If you are looking for an authentic Australian desert background for your bearded dragon's vivarium then you are going to be out of luck - if you are thinking of producing one you'd probably make a fortune (well, a bit of money anyway!). I had to settle for an Arizona background - it's a desert in any event, and Shrek and Fiona probably couldn't tell the difference. I would recommend poly rock walls that I put at each end of the viv. They are a good insulating material, and great for young beardies to climb on. Even as adults they like to rest on them to sleep as you can see from the picture of Shrek. Nowadays there are a number of different poly rock backgrounds to choose from. They might be expensive, but will make a much more attractive and natural looking vivarium. If you are a handy DIY enthusiast then you can make your own background. You will be setting up the heat and lighting to mimic their natural environment, so it can make sense to try and mimic the desert scenery as well. Although the overall 'look' won't matter much to your pet, there are some things which might appeal to you, but which have no place in a bearded dragon's vivarium. 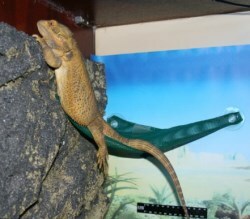 One other addition to my vivarium has been a hammock - Fiona enjoys lying in it, but Shrek uses it to rest his backside while he's on the wall. He stayed in this position for over 12 hours so he must have been comfortable! As you can see from the picture on the left the background has faded considerably which is a shame, but not a lot you can do to prevent that. How you accessorize your bearded dragon's home should consider two things - what will benefit him, and what will be pleasing to your eye. The needs of your bearded dragon should come first. In brief: water features, living plants, hides or heat lamp cages! Bearded dragons come from a dry, arid desert. They do not come across standing water, and have adapted to take the moisture they need to survive from the food they eat. Their lungs are unable to cope with high levels of humidity. This means that any kind of water feature, for example, a waterfall, has no place at all in their vivarium. A bowl of water is quite acceptable, although you will rarely, if ever, see your bearded dragon drink. Bearded dragons like to climb, so rocks and branches will be much appreciated. Rocks are great to position under the heat lamp so that you can get the basking temperature right. 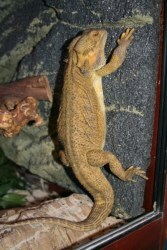 Juvenile bearded dragons love to climb. So plastic plants are very welcome, and you'll probably find your young bearded dragon will like to sleep in them. A decoration appealing to us is living plant life, but the hot, dry heat of the vivarium does not lend itself to promoting plant growth, and if you water the plant constantly then you will be raising the humidity in the viv. Any plants you might be tempted to use should be carefully researched to ensure that they are not poisonous to a bearded dragon. Beardies are not the most graceful of creatures, and a living plant will be easily knocked over - particularly during a cricket catching frenzy. There is no doubt that greenery in the vivarium is eye catching, and nowadays there are many plastic or silk plants that look reasonably realistic and you can use for a splash of colour. If you are attempting to mimic their natural habitat these plants will be out of place as there is only scrubland in the areas in which they are found in the wild. Bearded dragons need at least 12 hours per day exposed to UVB rays so their vivarium should not contain anything they can hide under. Although some beardies ignore hides, others go into them. Once they have found a hide and spend time in it they feel ill as they are no longer exposed to those all important UVB rays. Feeling ill they hide away more, and so the vicious cycle goes on. So either don't bother to put a hide in your vivarium, or be sure to remove it if your pet starts spending a lot of time in it during the day. You may be tempted to put a protective cage around your heat lamp, thinking you are doing your best for your pet and making sure he doesn't burn himself. Bearded dragons do love to climb, particularly when young, and will get into places you never thought they could get too. If you have a cage round your heat lamp you are likely to find a beardie hanging off of it at some point. A heat lamp cage means they are far more likely to burn themselves than if you didn't have one. Young bearded dragons are not as accurate as catching their food as adults, so most keepers will have quite a sparse set up at first for young beardies. Whilst great when they are older, crickets seem to like burrowing into polyrock walls and if any are left in the vivarium overnight may well come out and bite the young bearded dragon. I would personally advise having just the basics (basking log, rocks for climbing) for the first couple of months - basically only putting in what you'll be able to easily take out to catch any uneaten crickets. After that you can decorate away to your heart's content. Shown below was my original set up for my dragons. I chose a 'Climb and Bask' twisted vine formation which will allow the dragons to bask under the heat lamps. I bought a number of plants to decorate the vivarium, and you will notice I orginally added a cave. The cave had to come out when Fiona took to hiding in there, and wasn't exposed to UVB sufficiently. I did learn the hard way that beardies do not need hides! The vivarium is probably over decorated for young beardies, but you live and learn. One method is to use thermal insulation boards. These can be shaped into fake rock and background. After shaping your background can be glued into the vivarium, dusted with sand and sealed with non toxic PVA glue. If you're building your own background you can also include fake rocks and features sticking out from it, but don't get carried away with basking platforms or shelves - be mindful that anything your bearded dragon can hide behind will stop it getting those important UVB rays. It's easy enough to take out a cave, but not your rock feature you have carefully contructed. If your tank is in your sitting room then you may be tempted to make it into a living ornament. This is fine - as long as you are aware of what you should, and shouldn't, put into a vivarium. It is useful to remember that bearded dragons (pogona vitticeps) come from the Australian plains.